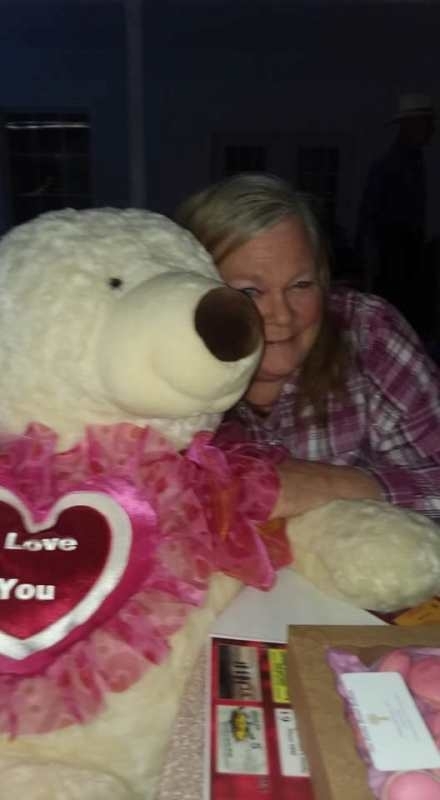 Bonnie Walton with the Teddy Bear (donated by Jessica Watts) that she won at the Valentines Day Dinner sponsored by the Talihina Chamber of Commerce and Visitors Center at Pistols and Pearls. The Talihina Chamber of Commerce sponsored a wonderful Valentine’s Day Dinner at Pistols and Pearls beautiful White Barn. The food was prepared by the Talihina Chamber of Commerce Members and staff; it was served by Mrs. Bradbury’s very helpful Talihina School FCCLA students. Brian McClain provided the music; there was dancing, door prizes and a drawing for some wonderful prizes. There were a lot of winners; everyone had a really good time. It was a night to remember. We would like to thank all our sponsors, this event would not have been possible without them; Walmart (Poteau & McAlester), Marvin’s (Poteau), Choctaw Nation Market & Cedar Hill Auto Supply (Clayton), Red River Realty, Valley Super Foods, Dollar General, Horse Heaven Ranch, Lawson Pharmacy, Redeemed Furniture & More, Bumper to Bumper, Gina Gregson, Spike’s Corner Garage, Rockin H, Jessica Watts, Allelujah Therapeutic Massage, Back Roads Guided History Tours Committee and Susan DuBose (Talihina), Creekside Soaps(Leflore), Holiday Inn Express, Element Day Spa, and Main Street Barbeque(Durant). Proceeds from the event went to the Talihina Chamber of Commerce and Visitors Center. We promote tourism and support our local businesses and strive to bring new businesses to the area.